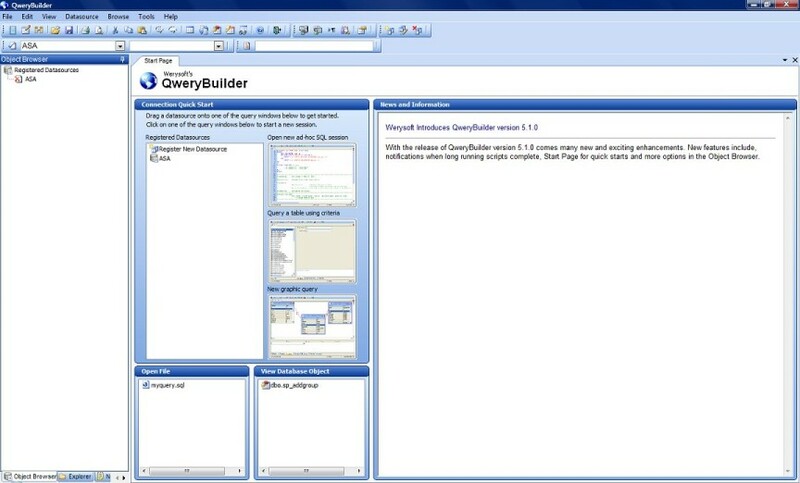 QweryBuilder is a database development and query tool. QweryBuilder's purpose is to make accessing information from a database simple, quick, accurate and efficient. An end user can extract and update data without writing a line of SQL. Database developers can create procedures, tables, views and triggers with fewer keystrokes. Best of all, you can do this with your SQL Server, ASE, SQL Anywhere and Oracle databases in one single application. QweryBuilder implements innovative ideas to make the interaction between you and the database quick, accurate and efficient. We have developed a creative solution to make this all possible...Try QweryBuilder Today!. Qweas is providing links to QweryBuilder 7.1.0 as a courtesy, and makes no representations regarding QweryBuilder or any other applications or any information related thereto. Any questions, complaints or claims regarding this application QweryBuilder 7.1.0 must be directed to the appropriate software vendor. You may click the publisher link of QweryBuilder on the top of this page to get more details about the vendor.